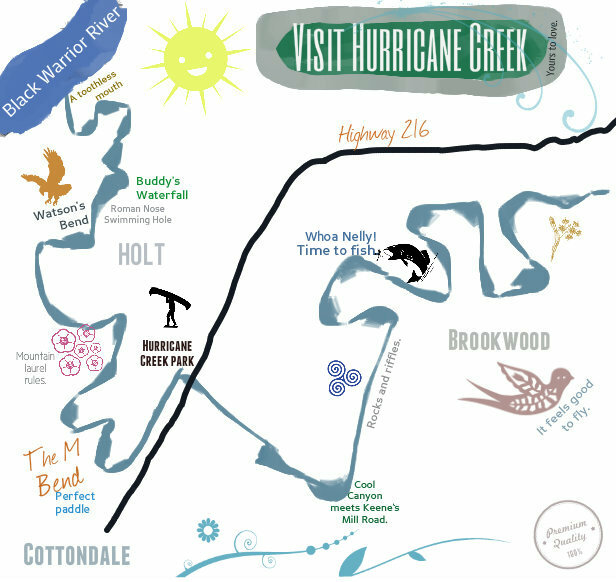 It is difficult to spend a minute at Hurricane Creek without overhearing the conversations of various birds- some local and some en route to other destinations which suit their annual migrations. 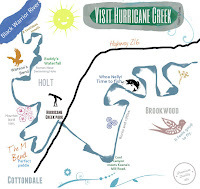 Please share your photos or observations of bird species at the creek so we can add to our shared knowledge about the life at Hurricane Creek. Considered to be the most vocal of American hawks, the Red-shouldered Hawk lives in forests with open understory, especially bottomland hardwoods, riparian areas, and flooded swamps. It feeds on small mammals, birds, reptiles, amphibians, and crayfish. 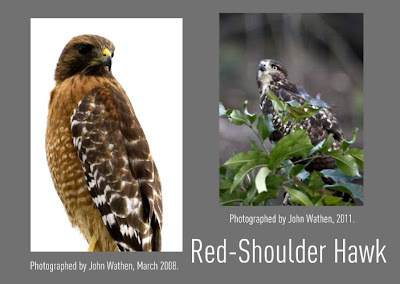 The clearing of forests over the last two centuries probably led to decreases in populations of the Red-shouldered Hawk, while increasing habitat for the Red-tailed Hawk. Populations appear stable, but may be declining in some areas. Finding the nest of a Red-shouldered Hawk can be a fascinating experience for visitors to the Hurricane Creek watershed. The nest is a large bowl of sticks, dried leaves, strips of bark, Spanish moss, lichens, and live conifer twigs. It is lined with fine bark, mosses, lichens, and conifer twigs and placed in the main crotch of a tree, often near water. By the time they are five days old, nestling Red-shouldered Hawks can shoot their feces over the edge of their nest. Bird poop on the ground is a sign of an active nest. Listen to the vocalisms of this hawk. Ospreys are very large, distinctively shaped hawks. Despite their size, their bodies are slender, with long, narrow wings and long legs. Ospreys fly with a marked kink in their wings, making an M-shape when seen from below. Ospreys are brown above and white below, and overall they are whiter than most raptors. From below, the wings are mostly white with a prominent dark patch at the wrists. The head is white with a broad brown stripe through the eye. Ospreys search for fish by flying on steady wingbeats and bowed wings or circling high in the sky over relatively shallow water. They often hover briefly before diving, feet first, to grab a fish. You can often clearly see an Osprey's catch in its talons as the bird carries it back to a nest or perch. Look for Ospreys around nearly any body of water: saltmarshes, rivers, ponds, reservoirs, estuaries, and even coral reefs. Their conspicuous stick nests are placed in the open on poles, channel markers, and dead trees, often over water. 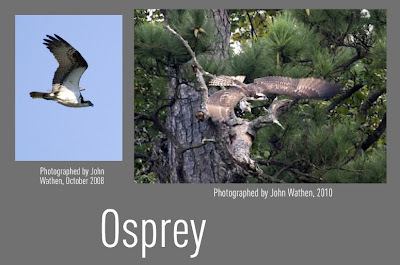 An osprey's presence can indicate fishable waters. Listen to an osprey. The Great Blue Heron is a regular sight at Hurricane Creek. As the largest of the North American herons with long legs, a sinuous neck, and thick, daggerlike bill, the Great Blue Heron lives in saltwater and freshwater habitats, from open coasts, marshes, sloughs, riverbanks, and lakes to backyard goldfish ponds. It has also been known to forage in grasslands and agricultural fields. Breeding birds gather in colonies or “heronries” to build stick nests high off the ground. Hunting Great Blue Herons wade slowly or stand statue-like, stalking fish and other prey in shallow water or open fields. Watch for the lightning-fast thrust of the neck and head as they stab with their strong bills. Their very slow wingbeats, tucked-in neck and trailing legs create an unmistakable image in flight. Listen to the Great Blue Heron's various calls. Photo taken by John Wathen. The red-bellied woodpecker is a handsome resident of many southeastern woodlands. As its name indicates, the belly is a light red or pinkish color. The red belly is often hidden from view as the bird perches or feeds against a tree trunk. Our friend is a male, which you can identify by the red coloration on the top of the head and neck. Females lack the red coloration on their head. The back is prominently striped horizontally with black and white barring. A white patch at the base of the primary feathers is highly visible in flight. 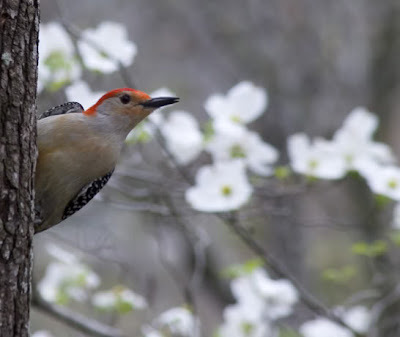 Unlike many other woodpeckers, the red-bellied diet consists of more fruit than insects, including many wild berries. It hangs upside down when feeding on berries. It also feeds on acorns, beech mast, seeds, beetles, grasshoppers, ants, and other insects. Its bill is used to probe for insects in trees and stumps. This bird is also known to store or cache food items in cracks and crevices of trees, fence posts, and other wood products. Learn more at Outdoor Alabama. Special thanks to Anne Wynn for helping us identify this gentleman.